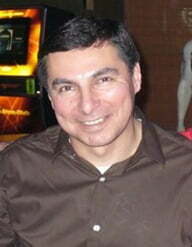 Originally from Alamosa, Colorado, Mark is of Chiricahua Apache and Spanish/French descent. Mark served 16 years as a Roman Catholic priest, including 7 years on the Navajo and Hopi reservations, before being assigned to two churches in New Orleans where he founded a ministry for children with disabilities. In 2006, he was appointed Assistant Director of Disability Affairs and, in 2008, Executive Director of the Governor’s Office of Indian Affairs, assisting Louisiana tribes in the aftermath of hurricanes Katrina, Gustav and Ike. Seeking a change of career outside church and state politics, Mark joined PWNA in 2010 to help establish a Long Term Solutions service focused on sustainable gains for tribal communities. Today, Mark identifies and cultivates partnerships with local businesses, corporations, nonprofits, tribes and philanthropists to support the work and mission of PWNA. He lives in Arizona.